Velvet (Piscinoodinium pillulare) is a flagellate parasite with chloroplasts, while ich is a ciliate, both have similar life cycles, but unlike ich, velvet can use its chloroplasts during dormancy to survive (which is where controlling light can help), but in a full blown infestation, the parasites get their nutrients from the host and are NOT dependent on their chloroplasts. This is an area of some controversy as some old school methods claim light and salt (sodium chloride) will treat and cure velvet. HOWEVER this has been proven false along with the assumption that this is a parasitic algae (due to having chloroplasts), this too is not true as this is a flagellate protozoan. 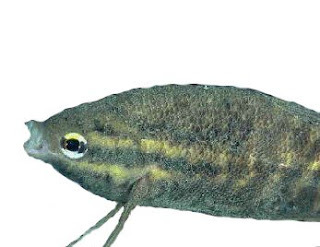 This parasite is MORE RESISTANT to higher salt levels than ich (Ichthyophthirius multifilis) and uses the chloroplast to produce nutrients (via chlorophyll and light) when a host is not available or to supplement nutrients derived from the host. It should also be noted that Marine Oodinium parasites do NOT have chloroplasts. Piscinoodinium pillulare are flagellate protozoa, single-celled organisms that move around by thrashing their whip like flagella. 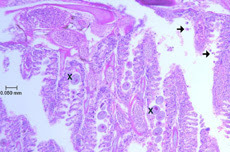 There are many species of flagellates that are part of the normal intestinal fauna of fishes, and many more kinds of free-living flagellates make a living in the mucus of fish gills and skin, without attaching themselves or causing trouble, but even some ordinarily harmless ones can become pathogenic in stressed hosts. Piscinoodinium pillulare is not harmless; it puts down a root like extension and can burrow into the skin or gill tissues. Giardia lamblia is a similar flagellate protozoa in humans that can cause severe acute diarrhea which may lead to a chronic diarrhea and nutritional disorders. Look for fish that scratch or ‘flash’ their bellies in attempts to scrape their gills against stones or gravel. Rapid respiration or fish that hide or sink to the bottom and clamp their fins, in classic symptoms of malaise. Velvet moves fast, faster than Ich. If you're unwary, you may not realize the fish is being attacked by Velvet until it begins to lose its glossy shine and seems to have patches of yellowish to golden-brown or rusty-colored varnish (which is where the term ‘Velvet’ came from). If you turn out all aquarium and room lights and point a flashlight at the fish, this will make Velvet more visible. Velvet can also settle out in the gills, where it will send down a root like extension into the gill lamella and dissolves cells then absorbs their contents. This causes extreme gill itch and swelling. In really serious infections, the gill cover may also become swollen. Fish can be killed by Velvet in a few days, either directly from suffocation in the Gills or from secondary bacterial infections. Copper Sulfate is one of the more effective treatments, as it kills both dormant (destroying the chloroplasts) and kills the free swimming stage as well. However Copper solutions can also be hard on many sensitive fish and when used at therapeutic levels, it can be difficult to purge from the aquarium. As well if the diagnosis is incorrect and the disease is freshwater Ich, Copper solutions while effective for marine versions of Ich is more marginally effective for freshwater versions. Methylene Blue (this should be used as a medicated bath, buffered with other ingredients, or used in a hospital tank, not as a direct treatment in a display tank) is also very effective and has the added bonus of being a hemoglobin transfer agent for the blood just when the fish need it most. Another effective treatment is Acriflavin (often my first choice), especially when concentrated and combined with NaCl (such as in "AAP Super Velvet Plus"). To a slightly lesser extent, malachite green and formalin may also be useful. AAP Super Velvet Plus can also be alternated with AAP Super Ich Plus if you are unsure of the diagnosis. This combination is my first choice, if you are unsure of your diagnosis (or the Medicated Wonder Shell combination below). This is why the Medicated Wonder Shells are one of the better treatments for FW velvet. These medicated blocks contained buffered Copper, Acriflavin and Methylene Blue, three of the better treatments for this infestation along with malachite green. These blocks also add electrolytes and calcium, both essential to good healing. 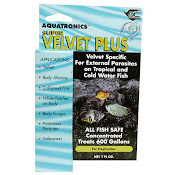 Another possible treatment choice is Quick Cure, although I have not found this quite as effective for true FW Velvet as it is for Ich or Costia (it is also now discontinued by the manufacturer). 30 minute, twice daily medicated baths using Methylene Blue and possibly one teaspoon of sodium chloride (salt) per gallon are also very helpful for the treatment of Velvet (and related flagellate parasites as well). Back to lighting, this may help with low infestations just like salt does with ich in low infestations, but in a full blown infestation, just like salt, it is overrated. I have witnessed this first hand in my Aquarium maintenance business, even with lights off! Costia is a single cell microscopic parasite that attacks the skin of fish. It is a flagellate similar to velvet, however without the chloroplasts. It destroys the skin, in mild cases the skin appears cloudy (again similar to Velvet), in severe cases the skin is open and bleeding. 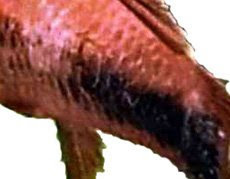 The epidermis (skin) clouds up in in random areas of the fish, then comes off, often leaving bloody patches (although secondary bacterial infections can leave nodules). It usually attacks fish in a poor state of health or living in poor water conditions or in overcrowded conditions. Secondary bacterial and/or fungal infections can occur at the open sore area. Costia can only survive on fish. As well, Costia usually inhabits the gill and skin and once attached to the host it destroys tissue at that site. This is why when found in the gill, Costia is so devastating, when present in great numbers Costia will destroy gill tissue. In very small numbers Costia presents little problem (symptoms for minor infections include sloughed off scales), however in poor water conditions Costia can kill rapidly. 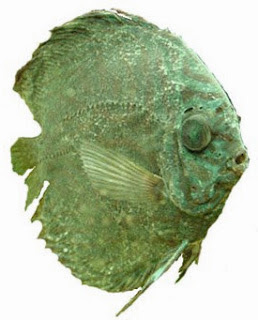 Costia can survive in temperatures greater than 86 degrees F.
A common symptom of Costia is for "cloudy and milky" patches to appear on the fish. Costia is often and mistakenly blamed on scratching, flashing and similar in fish, however although fish with a Costia infestation may flash/scratch this is not a very clear sign of a Costia infestation and is more likely early symptoms of velvet, Ich, Shimmies (livebearers, mollies in particular) or simply stress from poor water conditions similar to shimmies which is most often caused by improper mineral/electrolyte levels. Luckily, if what one thinks is a Costia infestation is actually Velvet, treatment is similar as above for Velvet (although I have found 27% formalin or Quinine Hydrochloride plus malachite green based formulas more effective for Costia and Acriflavin & copper less effective for Costia). 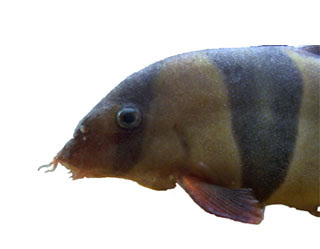 Costia is more common in aquariums when fish are under stress (often new fish can present an opportunity for a Costia Infestation). For true Costia infestations, clean water with good parameters (ammonia, nitrites, nitrates, GH, KH) are a MUST. This includes maintaining positive mineral ions of calcium and magnesium which in turn maintains a healthy Redox Balance that is so woefully misunderstood by many as to its importance in treatment and prevention of many diseases including Costia. The use of medicated baths containing Methylene Blue OR Potassium Permanganate (PP is usually more effective for true Costia versus Velvet). Then treat the aquarium with either AAP Super Ich Plus, Quick Cure, or Kordon Rid Ich Plus for moderate to serious infestations. Please do not confuse Organi-Cure with Quick Cure by the same company, these are NOT the same product and as per our extensive testing/use Organi-Cure is NOT an effective substitute. For mild Costia infestations, Copper Sulfate or Medicated Wonder Shells can work. While some web sites recommend acriflavin and copper for Costia, my tests have shown that these two chemicals are much more effective for Velvet (which are often similar in appearance), while products containing formaldehyde are more effective for Costia. One important note about Costia (& Velvet) from my experience, and while anedotal, it is still worth mentioning and that is I have found the Costia responds best to treatments containing formaldehyde such as Quick Cure or Rid Ich Plus. HOWEVER IF treatments that that are normally effective for Ich infections such as standard Rid Ich, Super Ich Plus, Herbal Ich Attack, etc. that do NOT have formaldehyde or similar aldehydes (although pure formaldehyde is more effective than aldehydes) are failing what you may think is an Ich infestation, this may be Costia. While the above method of identification is a poorly scientific diagnosis method, I have observed this with clients and their aquariums over the years on many occasions where they thought that they had an Ich infestation and upon my arrival found that it was not the case, rather it was Costia (or occasionally Velvet) and a change in treatment to Quick Cure often achieved immediate results. It is also noteworthy that Costia resists drying. Empty tanks, nets, even dried nets, scrubbers, and hoses can transmit infective Costia from one tank of fish to another. Finally Costia can occasionally look like Sporozoa (or vice versa) due secondary bacterial infections common to Costia that then leaves nodules, however the best visual diagnosis of Sporozoa (aka and more correctly known as Apicomplexa) are whitish translucent areas, not caused by slime form on the skin. Another unfortunate way to often differentiate the two is that Costia is generally easily treated with the above mentioned remedies if caught reasonably early, however Sporozoa is usually fatal and the only reasonably successful remedy is Nitrofurazone, which can be combined with ParaGuard 2 if uncertain what you are treating. Read this article beginning before ANY fish disease treatment! *AQUARIUM MEDICATIONS, treatments, how they work, and which ones to use and not to use. For information about Aquarium Ich; Ichthyophthirius multifilis and Cryptocaryon irritans treatment, identification, and life cycle, please visit this site. Aquarium Lighting; Complete Information Understanding what makes for correct lighting is very important, even for fish only aquariums! The above product reference sells only the best germicidal, hot cathode, low pressure, high output UV Bulbs! For a friendly, knowledgeable, aquarium forum with in a family atmosphere.